Congratulations to our Colt Character Trait Winners for the month of September! Sumner Fall Fest is October 22. Mrs. Wagner is looking for Volunteers to help for service hours. All Softball uniforms and helmets must be turned in by Friday. Juniors interested in taking the PSAT (Qualifying test for National Merit Semifinalist), see Mrs. Antici to sign up. Seniors interested in attending a preview day for pharmacy at Ole Miss see Mrs. Antici for information. Varsity Football game Friday night at Home vs. Indianola Academy. SENIOR NIGHT- all Seniors who play Fall Sports will be recognized before the game. (6:30) Game time is 7:00. GREEN OUT GAME, FANS WEAR GREEN! GO COLTS! Grey, Comfort Color, Crew-neck t-shirt with pocket on front. Drop by the office to complete your order, and leave payment by this Thursday (Oct. 6) at 3:00! Don't miss the deadline! 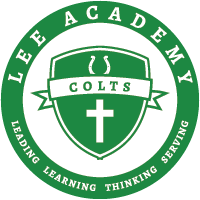 Please be sure to "like" our Lee Academy Facebook page if you haven't already.